Just one more ‘places’ entry before I return faithfully to all things design. I went to an opening a couple of weeks back at the Fraser Studios, and the atmosphere was positively buzzing. 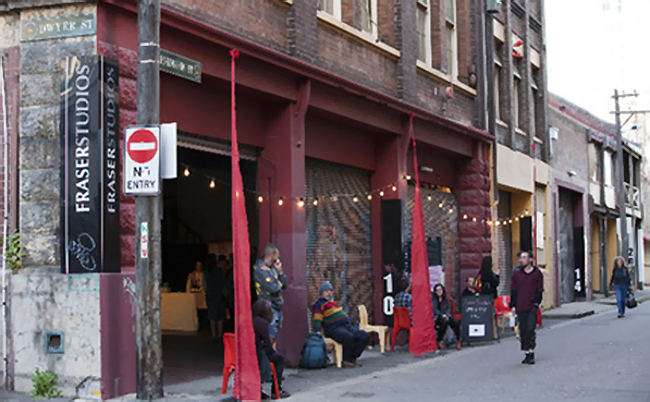 The space is only open for another few weeks and apparently as a last hurrah, they’re serving wine, beer and cider as well as a few tasty morsels from Bourke St Bakery at The Cake pop-up bar Thurs (5-10pm) – Sun (3-10pm) each week until the end of June. It’s right near the Clare Hotel off Broadway.